An affluent New York City couple finds their lives touched, intruded upon, and compelled by a mysterious young black man who is never quite who he says he is. Trippy's Favorite Films of the '90s. Flan: How can I look, I'm shaking! Ouisa: I want to know if anything's gone! Ouisa: We could have been killed! Oh, my God! The Kandinsky! Ouisa: It's gone, oh my God! Call the police! Flan: Oh, no, there it is. Oh! The silver Victorian inkwell! Q: Who was David Hampton? In New York, the art dealers John Flanders ('Flan') Kittredge (Donald Sutherland) and Louisa ('Ouisa') Kittredge (Stockard Channing) are ready to have a business dinner with their South African friend and client Geoffrey Miller (Ian McKellen), when a wounded young black man comes to their fancy apartment telling that he had been just robbed in Central Park and asking for help. He introduces himself as Paul (Will Smith), a friend of their son and daughter in Harvard and son of Sidney Poitier, and the couple invites him to stay with them. During they night, they find that Paul is not who he claims to be. When they investigate the life of Paul, they find the hidden truth. 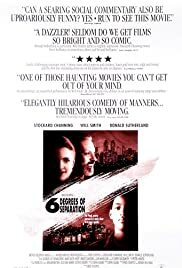 The first time I saw "Six Degrees of Separation" in 1993 or 1994, I was very impressed with this movie. I liked the concept of the six degrees of separation between human beings, but mostly the acting of Will Smith, Stockard Channing and Donald Sutherland. The very difficult and long lines were brilliantly presented by this trio of excellent actors and actress, almost as if they were on the stage. Further, the name of Stockard Channing in a film for me is a synonymous of high quality. Today I have just seen this movie again, and I maybe I am more critical with the years, but I found the screenplay quite confused. For example, the relationships of parents and sons and daughters are extremely aggressive from the side of the Harvard students, and I have not understood the point in the story. The affection of Louisa ('Ouisa') Kittredge for Paul Poitier- Kittredge could be a projection of what she would like to receive from her apparently ungrateful son and daughter, but her daughter actually talks to her. Anyway, this movie is intriguing and original and deserves to be watched. My vote is seven. 20 of 37 people found this review helpful. Was this review helpful to you?